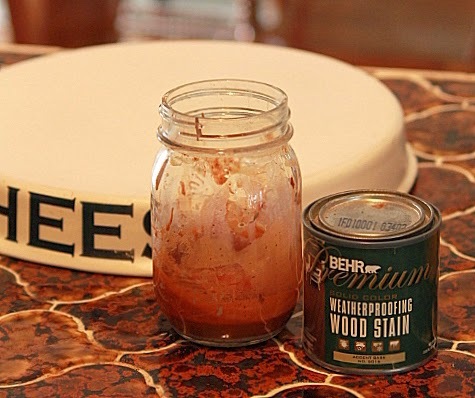 Antiquing wax made with stain or paint is easy to make, and a fraction of the cost of name brand dark furniture waxes. When you make your own tinted wax you choose the color and can control how dark you want the antiquing. The wax also works great on my DIY Chalk Like Paint and other paint finishes. Place two tablespoons of wax in a glass jar with a tight fitting lid. I used a mason jar. 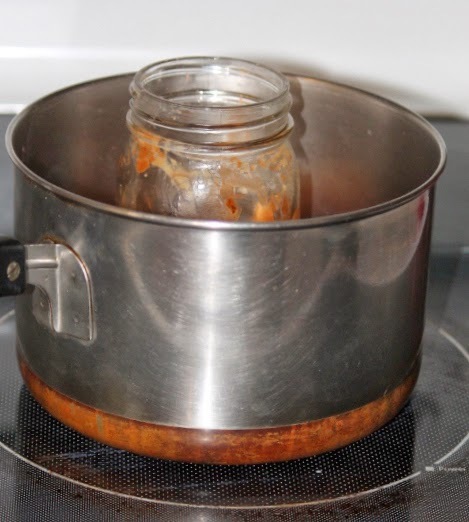 Heat a couple inches of water in a small pot, remove from heat and add the uncovered jar of wax to the water. Remove jar when the wax is a soft consistency or even melted. 3. Stir In Stain Or Paint. While the wax is soft stir in equal parts of either stain or paint. By adding paint to store bought wax you can achieve a darker color and using stain will give a more subtle tone. Water based or oil stain work equally well and I also used craft paint with good results. Test a small amount of the tinted wax and add more if you want a darker look. Make small batches to avoid the wax drying out. Use a clean rag, or inexpensive paint chip brush, to apply the antiquing wax working a small area at a time and pushing the wax in crevices with the paint brush. No need to buy expensive brushes made especially for applying wax. Wipe off excess immediately and buff. thanks Sherry, just pinned this! Thanks for this. I heard that French furniture people leave their wax in the sun to melt and then just brush it on. That's why their old furniture has such lovely pat incas. Sherry, thanks for sharing your technique for waxing! Great advice, for sure. That's good to know. I never knew you could do that. I do have some tinted wax already, but it's nice to know how to make it. Thanks, Sherry! I have pinned this so I won't forget it. Great idea. I have been using this wax for at least twenty years and I love it. I even use it on wood pieces outside. I gives a wonderful hard finish. I mix it with simple gel stain found at Hobby Lobby. I do prefer mine a little softer since it is easier to apply. Thank you for all the wonderful inspiration. I love your blog. Thanks, Sherry, I just got this information from a woodworker…but, he forgot to tell me about melting it! This was a timely post for me and I thank you, as always. Cool! Never thought this could be made on your own! Thanks dear! This is one of those "why didn't I think of that" posts! I have been looking for black wax…thanks to you my search is over! In the art field you learn this. It's a wonderful tip for getting the look you want. Hi Mary, You will want to use the wax in a soft stage or fully hardened. Be very careful with the melted wax because it is VERY hot. Thanks so much for this information. Just wonderful. we'll see how this works for me ? This is a great tip, thanks! Thanks. I bought the wax in plain and want to try differnt colors so I was really happy to find this. I also thought $30 to buy a wax brush? I don't think so! Thank you for this post! I really appreciate knowing this less-expensive and much more customizable option to the name brand waxes!